The pan-fried salty chicken  is great in a conventionally Japanese rice-based bento, but it’s also very good on top of a salad or in a sandwich. I’ve packed it here with some carrot kinpira  and lettuce, with the sliced bread packed separately so I can assemble a ‘fresh-made’ sandwich at lunchtime. The chicken and spicy carrots go together very well, and the mayo ties it all together. I made the chicken the night before, and just briefly reheated it in a dry frying pan skin side down to crisp it up. The carrot was stocked in the fridge too. 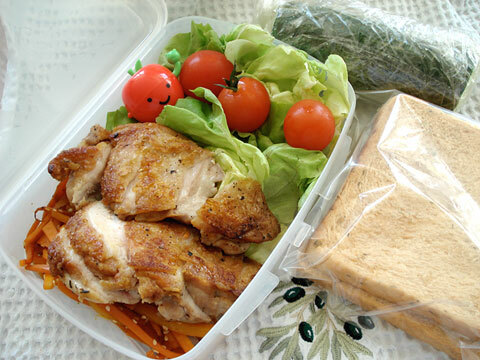 I usually prefer to assemble my sandwiches right at eating time - see bentos no. 6  and no. 24 . This avoids the problem of soggy sandwiches, or having to protect the bread by slathering on a high calorie barrier of butter and so on. If you are watching your calories very strictly you’d omit the mayonnaise (in the apple cup), and maybe take the skin off the chicken. But even with those two things the whole bento comes in in the mid-400 calorie range, so I’m happy with that. For the sliced bread I used a sort of tomato and herb flavored white bread (Toastbrot Mediterranée from Migros, for people in Switzerland), but whole wheat bread would of course be more healthy. The cucumber piece is cut in half, sprinkled with a little salt and dill, put back together and wrapped tightly in plastic wrap. By lunchtime it tastes like a very fresh dill pickle!